John Whitfield, bass; Bob Rummage, drums. This disc's ballad, "Stars Fell On Alaeama," could be taken as a tribute to Cannonball Adderley, even though Mike Smith's statement of the theme is comparatively unadorned, in clear, singing, Benny Carter-like tones. On the other hand, Smith's treatment of "Autumn Leaves" seems determined to subvert the popular 1958 Adderley version, with its fast tempo, its distortion of the Adderley intro, and Smith's own solo beginning with a parody of Cannonball's own opening phrases. Instead of Cannonball's swagger, Smith drives straight ahead, his harmonic substitutions emphasizing the inherent drama of his solo's design. Clearly, what Mike Smith has done, and this is true in general of his music, is isolate Adderley's fullness of sound and swing, the blue-ripe melodic essence, upon which to build his own art of power and purpose. And one thing more: intensity. It's this intensity, above all, that infuses all of his solos here with their concentration of form, and gives them their special character. The fine, natural flow of his musical lines, even as they reveal contrasts and conflicts of emotion, is emphasized by his fervor of expression and design. The best examples here are the fastest performances, for in "Don't Scare Me None" and two blues, "Jeanie" and Jimmy Heath's "Big P," Mike Smith eats up the beat like a starving carnivore, in fact, the fire of his playing in the three blues on this disc recalls an otherwise dissimilar player, the most intense of modern altoists, Art Pepper. This intensity surely goes with Mike's very blood and breath. Because of its unique construction, Wayne Shorter's "Speak No Evil" could be played as a cool drifting modal piece or as a 14-bar blues-with-a-bridge; Mike Smith's intensity makes certain that his solo is a hot modal improvisation, with staggering sheets of sound. This intensity can have its amusing side, too, as in the gently swaying samba "On A Cool Night," for after the piano and flugelhorn solos sustain the theme's faraway, fanciful atmosphere, Smith's alto burns it away like springtime sunlight. "Me being real hyper and high-energy, and Ron being laid-back--you need some relief, it can't be high-energy all the time, and that's why I like playing with Ron." Indeed, to take a drastic example, Ron Friedman's long, long tones, are a return to normalcy after the absolutely voracious alto solo in "Jeanie." As Smith points out, this contrast of hot alto and calm flugelhorn is purposeful: actually, Friedman typically arrives at rhythmic complexity in his solos, and a seemingly cool conception is given warmth by his sound and his melodic instincts. "Don't Scare Me None" is his only trumpet solo on this disc, and here, after the simple, sweet tones of his opening, he offers hard-bitten, raspy, growling ones as his lines become involved. Of the other skillful, big-eared musicians who appear here, John Whitfield, like Smith and Friedman, also used to play in Nineburner. The long-experienced Whitfield exemplifies the very best kind of modern bass playing: direct, unadorned, he powers the ensemble with singleness of purpose, and thereby impresses vigorous authority upon the music. Jim Ryan and Bob Rummage have been part of the Smith quintet since 1988. Of course, a leader as active and fiery as Smith fairly cries for a highly active drummer, which Rummage definitely is; moreover, his theme "Stu's Blues" perfectly captures the high-spirited blues heart of Smith's own playing. (Rummage's last appearance on Delmark was in Brad Goode's Shock of the New, Delmark 440). Ryan, who used to be Al Jarreau's accompanist, is a versatile pianist, at home in swing or modern settings; here, he proves the kind of sensitive band player whose quick responses inspire his mates and whose harmonic sophistication, in solo and in accompaniment, sets much of the group's tone. Or, indeed, overtone. For along with all the Mike Smith Quintet's intensity and seriousness of purpose, there's finally an overtone of optimism about this recording, a feeling that's again and again manifest in the clever webs of Ryan's piano, Friedman's droll humor, and in Smith's own upward leaps and elated riffing. Colorful, bluesy, melodic, swinging, this disc is music to raise spirits as well as temperatures. 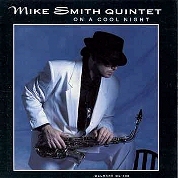 On a cool night, put the Mike Smith Quintet's music on your CD player or tape deck, and feel the heat warming up every corner of your house. --JOHN LITWEILER, from the liner notes.